Does the word GABION ring a bell? 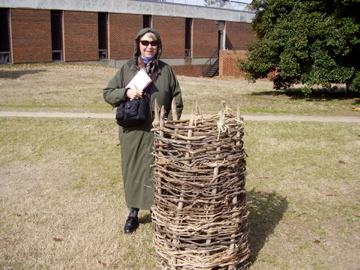 Well, here I am standing beside a gabion at the Yorktown VA battlefield. Any guesses as to what it was used for in the final turning point battle of the American Revolution? Do you think I can lift it? Would it make a corral for roaming cats? I was standing in the cold rain on a tour of the battlefield with my husband, John, when we came upon this odd-looking apparatus. I will leave you to guess or do a search until the next blog on March 1st. This sign marks the wonderfully preserved Custom House on the corner of Read and Main Streets in Yorktown VA. This historic structure has observed history pass by its front door for nearly three centuries. It is only a stone’s throw from the battlefield of the last pivotal battle of the American Revolution. It stands very near the site of the startlingly majestic victory monument raised tall to commemorate the Franco-American cooperation that helped to birth our great nation.In the early 1700’s the lot where the Custom House now stands was owned by Capt. Daniel Taylor. Since Taylor did not build on the lot, it was passed on to George Burton in 1706.After that it was decided that a Custom House was necessary for the mouth of the York River as Yorktown Harbor was the deepest, most navigable harbor between Charleston SC and Philadelphia, PA. Wealthy merchant, Richard Ambler, was appointed Collector for the Port of York. In 1720 he purchased 2 lots where the Custom House now stands, and in 1726 he purchased 2 more lots. He built the brick Custom House and he and his family lived in the wooden home that adjoined it.Toward the end of the Revolutionary War, in 1781, the British Army, under General Lord Cornwallis, occupied Yorktown and used the Custom House as barracks for their troops until the surrender of Cornwallis to Washington and Rochambeau on October 19, 1781. The building was in the midst of war again during the Civil War. In 1865 the wooden residence to the right front of the building was burned to the ground. At one time thereafter, it is said that pigs lived in the ruins of the cellar. For the next 40 years the Custom House served as a physician’s office, followed by various uses as school, general store, even as a bank, barber shop, and housing for military personnel during the first World War. In 1922 Mrs. Emma Leake Chenoweth established the Comte de Grasse Chapter of the Daughters of the American Revolution in Yorktown. A building fund was created, and the Custom House property was purchased by the DAR from Mrs. Adele M. Blow, member of the Comte de Grasse. Chapter Fundraisers were held, such as bake sales stand a fancy dress ball. Plays were produced to secure the necessary funds to complete the purchase in 1924. DAR member Mrs. Lettie Pate Whitehead Evans took over the restoration project and assumed the funding of it on her own. Final results included a walled garden, replicas of original dependencies, and basic structure repair. Finally the building was dedicated in November 1930 and has been open to the public on Sunday’s and holidays ever since. In 1972 The Yorktown Custom House was designated as one of only twelve historic custom houses extant in the United States. This historic building served as protector of American citizens from 1779 to 1945. It is listed in the Virginia Landmark Register and the National Register of Historic Places. 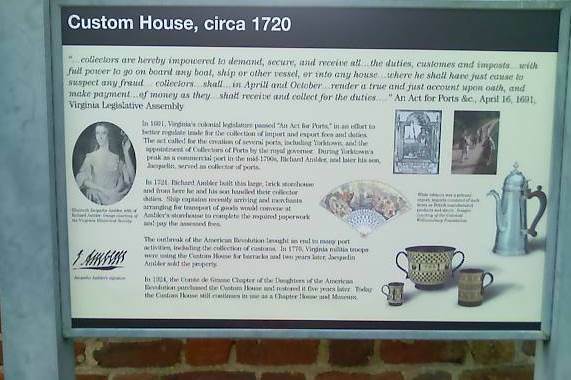 Every year the Comte de Grasse Chapter of the DAR opens the Custom House to the public on October 19th, the anniversary of the winning of the 1781 Battle of Yorktown under the command of General George Washington and General Rochambeau’s combined Franco-American armies. 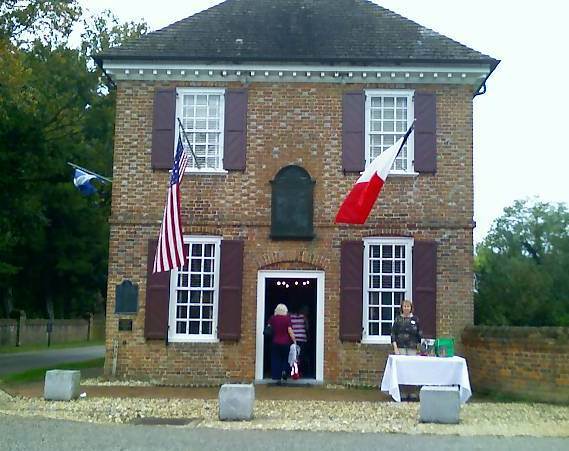 In the picture below Jini Jones Vail, author of Rochambeau, Washington’s Ideal Lieutenant, A French General’s Role in the American Revolution, was invited to set up a book table on the Yorktown Day Parade Route in front of the famous Custom House. She was waiting for the parade to begin. It was an exciting time to be there as the Yorktown Day Parade marched by with all the Fife and drums, marching bands and the local Revolutionary War regiments in regimental dress. Jini and her husband, John, had ringside seats for all the action on the Washington-Rochambeau Revolutionary Route ( W3R) that day. Jini was grateful for the kindness shown to her, a sister member of the US DAR Trumbull-Porter Chapter of Connecticut. She hopes in the future to be able to return the favor at a Connecticut DAR event.